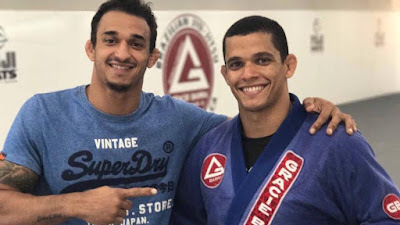 Gracie Barra Northridge just added another elite black belt to their roster. Victor Silverio has been a standout of GF Team for years, going white to black under the fiercely competitive team’s banner. He has been running his own GF Team acamdey in Florida until now, but confessed that the lack of regular elite training partners and running a school distracted him from being a full-time athelte. Siliverio has told that he is leaving GF Team under good terms and spoke with leader Julio Cesar Pereira before making up his mind. “I’m really thankful for everything that gfteam did for me. And I’m really grateful for Romulo opening the doors of his gym for me. I had an opportunity that I couldn’t waste and I will be a full time athlete, something that I couldn’t be in Florida”. Silverio’s training predicament is swiftly removed on the mats at Gracie Barra Northridge. Romulo Barral’s academy is absolutely stacked with talent, featuring Gabriel Arges, Edwin Najmi, and AJ Agazarm- plus regular visits from Otavio Sousa, Felipe Pena, and more. It’s tough to find a more elite room anywhere on the planet. It’s clear that SIlverio is joining a team that he believes facilitates the training needed to win a World Championship, but what remains to be seen is how Silverio will fit in the team’s competitive rotation- Gabriel Arges and Otavio Sousa are already installed at middleweight for Gracie Barra – Silverio’s normal division, and the in-house competition doesn’t get any slimmer at lightweight or medium-heavy. At first glance it seems Silverio could be on the losing-end of closeouts wherever he goes, but only time will tell how that plays out. ZR Team in London – Ukrainian fighters won gold!